U. F. Grant contributed some of his best material to the Tarbell Course in magic. Most of this material is unique to the Tarbell Course and does not appear elsewhere. Before Grant died, he compiled a manuscript containing all of the material he contributed. It ranges from close up to stage illusions. 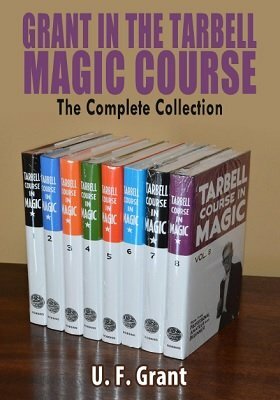 A lot of magicians don't have the original Tarbell Course , so here is your chance to get all of the tricks he created and contributed in one place. Fully illustrated and one of the best buys in magic. This is stuff you will use and do and as Harlan Tarbell said, some of the best magic in his course. One of the best tricks that Grant created was Ghost Knot, where a single knot is tied into a piece of rope and visibly vanishes. According to Harlan Tarbell, this is an effect that will baffle and befuddle your smartest spectators. One trick Grant created is worth the price of the PDF and is a real fooler. Walk out with a small cardboard box folded flat, open it up and show it empty on the inside, immediately reach inside and produce a real watermelon. If you do outdoor shows for picnics, then this is the perfect effect and can be a selling point. The watermelon can then be given out to be cut and eaten. No need to buy a watermelon, use any watermelon at the picnic. A real fooler that will amaze your audience. This is just one of the many tricks you will learn in this PDF. 1st digital edition 2017, 41 pages.